Garage sale tragics, listen up! In early April, get yourself on the Garage Sale Trail to pick up bargains galore. Sunday 10 April is the official Garage Sale day and the date that hundreds of households all over Australia will open their garages to the public. Sales will take place all over Brisbane and all over Australia, from Hobart to Alice Springs. You can also purchase some items on the Garage Sale Trail website. The Garage Sale Trail (GST) has two purposes. There's the environmental concern – by promoting large groups of people to recycle their unwanted household junk, rubbish is being kept off the street and there's a reduction in new items being created. Then there's the community aspect – organisers encourage communities and neighbours to band together and get to know each other. The streets become a happier and friendlier place. If you would like to join in by hosting a garage sale, visit the website to register your event. You can run a sale as an individual or with other households. The GST website also provides helpful tips and hints for presenting your sale and keeping it green. If you're a dedicated bargain hunter, you can download the Map app to ensure that you don't miss anything, and check out articles about etiquette and haggling on the website. Of course, you don't have to wait until April to host your own garage sale. 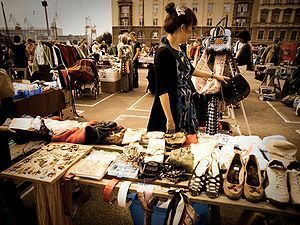 Flog your pre-loved goods any time – see this article for more information.